← Welcome from the Opinionated Gamers! Let me start with a little fan girl confession; I love, love, love, love Hansa Teutonica. I will probably write a column soon on why I love it so much (top 5 games of all time, for me) and what I think of the new expansion for it, but I want to wait until I’ve played the new expansion a few more times. Anyway, when I saw that there was a new game at Spiel 2010 in Essen by Hansa Teutonica author, Andreas Steding, it was a must buy for me. This game is completely different from Hansa Teutonica. I like it and I’m glad that I bought it, but it is so completely different from HT that I would tell others that enjoying (or disliking) one would not predict what you’d think of the other. Players are…. Gosh, this one is a hard one to sum up. You are doing lots of different things and at the end of the game, lots of different things are worth victory points. The person with the most victory points wins. Keeping track of the different ways to earn points at the end (and their relative worth) caused us to check back with the rulebook often during the game. I’m actually going to dive right into game play, as I think it’s the best way to also offer my opinion in a way that makes sense. The game is played in four rounds and each round is played in two phases: the “secret and simultaneous” phase and the “what do you actually end up with” phase (my terms). The first time I played the game, the first phase went quickly enough and I found that I didn’t mind the secret and simultaneous part—though typically this is a mechanic I abhor. In later games, I found that I did start to get a little annoyed by this phase, but not for the usual reasons. But I’m getting ahead of myself. Here’s a bit more about the phases and how they work. Planning Phase and Action Phase (which to me feels like one phase, the one I call “the secret and simultaneous phase”). Players will be visiting guild houses where they can perform one of three actions. First, each player secretly and simultaneously decides which guild houses they want to visit. 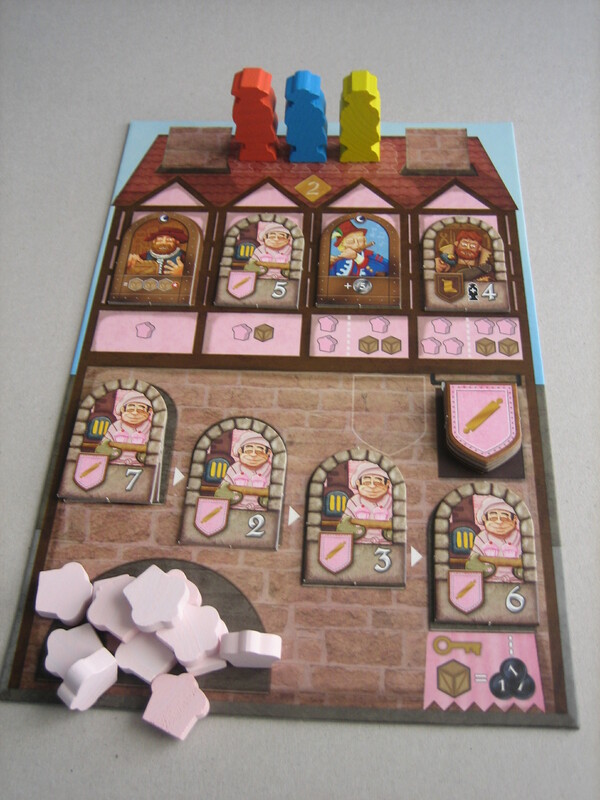 Since you start the game with only four agents (meeples/workers/whatever), you could choose up to 4 guild houses to visit. If, however, you only visit one or two guild houses, then you will go through another round of secret and simultaneous for your remaining agents and can revisit guild houses you’ve previously visited. In our first game, players had finished placing all of their agents by the end of two or three rounds of secret and simultaneous. In my second and third games, however, players started to realize the benefits of slow playing…choosing to deploy only one agent a round. As players acquired more agents, this could mean as many as six or more rounds of secret and simultaneous guild selection as everyone wanted to have the ability to go last. This caused the game to drag out a bit and while it might have been the better play when your goal is to win the game, it made the game a bit less fun. 3) recruit a guest (a tile that may have an immediate effect, a one-time effect later on, or may contribute to your victory points at the end) and change the turn order (you have the choice to jump to first in the turn order—which also would then win you ties). These tiles are paid for with the beer, cupcakes, etc. that you buy and sell from the guilds and this is how cupcakes can end up at the brewhouse. Once all players have used up all of their agents (possibly after many rounds of secret and simultaneous destination selections and resolutions), then you move on to the other phase. At this point, players have a collection of beer from the brewhouse, cupcakes from the baker, and so on (the number of guilds played with depends on the number of players). The person with the most beer earns a shield from the brewhouse and the guildmaster tile (tiles that earn points at the end of the game like the ones that can be recruited in the third action of phase one). The person with the most cupcakes earns a shield from the baker and the guildmaster tile (and so on). Ties are decided by the turn order as it stands at the end of the first phase (which is one reason why slow playing and being the last player to have an agent to play in the first phase can be advantageous). These two phases are alternated 4 times (with new guests to recruit and new guildmasters put out each round). At the end of the game, the person with the most valuable guests from the brewhouse earns points with points also awarded for second and third place. This is repeated for each guild. Players also earn victory points for having a variety of shields (so having won two shields from the baker doesn’t help—but it keeps another player from getting it). The player with the most leftover money gets victory points. There are guests that give bonus victory points. And so on. The person with the most victory points wins. 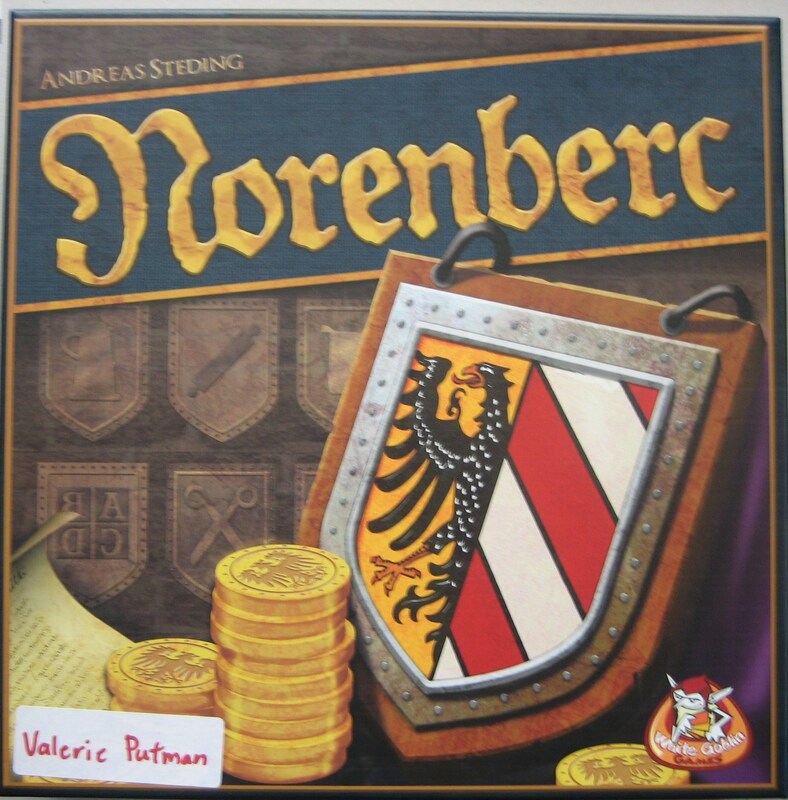 Okay, so I guess I should have started with something like, “Players are vying for control of the guilds in Norenberc (the name for Nuremberg in the middle ages).” But since I don’t care much about theme and the theme doesn’t help you play intuitively in this game, I didn’t bother. This should be a big clue to those of you that do care about theme that this might not be your kind of game. No, in this game I felt like I had a variety of choices that earned me victory points in a variety of ways. The key is to choose a different path than the other players in any given round so that your tiles and shields are earned as cheaply as possible—money is tight and the way to victory is efficiency. The first play of the game was the most fun because we played fast and loose and the first phase moved quickly. Later plays saw more thoughtful turns and this dragged the game out a bit. So, perhaps you should keep your game group in mind as you decide whether or not this one is for you. In the end, I do like it and I look forward to additional plays, but it is no Hansa Teutonica. Patrick Korner’s Opinion: I very much wanted to like Norenberc. Like Valerie, I like Hansa Teutonica a lot, and I’d heard some good things about Norenberc, so it was one of the first Essen releases to grace my gaming table. Sadly, I rapidly discovered that this game wasn’t my cup of tea. It felt like agents (and the ability to have lots of them) were too all-important, which meant that players who got extra agents early in the game had an almost insurmountable advantage over those who had fewer. Not just because having more agents lets you do more things, but because you can also defer your plans until after the other players have run out of agents, thus freeing you to do things unopposed and in reaction to the rest. For a game where a big part of it is getting guild shields thanks to how many goods of each type you have, being able to buy just enough goods at the end to take away majority without having to defend yourself from retaliation is a bit of a deal-breaker. I also found the game’s theme to be more or less non-existent. The art is cute, and I do like cupcakes, but this could just as easily be about collecting any sort of widgets. So, overall, a ‘not for me’ rating from me. Tom Rosen’s Opinion: It is no Hansa Teutonica indeed. Andreas Steding came out of nowhere last year – at least for me – with the fantastic Hansa Teutonica (almost reminiscent of William Attia in 2005). It could all be about expectations though. I went in to Hansa T. (as I affectionately call it) with little to no expectations and ended up being very pleasantly surprised. A year later I went in to Norenberc with high hopes (the “Puerto Rico / Mammoth Hunters effect” if you will) and so perhaps I was destined for disappointment. As Valerie explains, Norenberc is completely different from Hansa Teutonica so their fans will likely overlap very little. Although I will note that a salient feature of both is that players score for a ton of different factors at the end of the game (okay only about six or so in each) and players can specialize or diversify as they please, which is a nice feature but makes it daunting to keep track of the possibilities. In the end, Hansa T. felt fresh and different, whereas Norenberc feels like a more classic stock market game of buying goods low and selling high. I rated it the oh-so-helpful “Neutral” below because I would be fine playing it again, but at this point don’t believe the game offers enough to distinguish itself to merit owning. Joe Huber’s Opinion: (1 play) Tom’s right; it is no Hansa Teutonica. Since my one play of Hansa Teutonica was one of my least enjoyable gaming experiences of the past decade in spite of playing with three people I really enjoy playing games with, this is a good thing in my book. But whereas Hansa Teutonica felt themeless, this feels – nonsensical. To the point that as we were sorting out the rules, we came up with entirely different explanations for the actions. For example, agents – for no good reason – go to the roof of the guild they visit after conducting their action, so we added the helicopter phase, to get all of the agents back down. Even silliness couldn’t give us a reason why beer can only be sold to the brewery, however. If the thematic problems were the only issue, I wouldn’t mind the game as much as I do, however. The actions you take each turn are, on the whole, rather enjoyable. But the scoring of the game is broken; difficult actions are worth very little, while easier tasks are heavily rewarded. Specifically, collecting craftsmen of one type with a value of 30 – possible, but very difficult – is worth 2 VP, as compared to 5 VP for one craftsmen of each type, and 20 VP for having 7 different crests. In our game, I realized the imbalance, and scored more that the combined score of the other three players in the game. But once everyone understands how the game is unbalanced, players will simply contest the interesting rewards and ignore the low return ones. Add in the tendency to play slower with experience, as Valerie notes, and the game seems doomed to run at a sluggish pace, and be less and less fun over time. Dale Yu’s Opinion: Let me start by saying, that I’m not a theme person. Often when I’m reading the rules and someone asks me to explain the theme, I’ll say: “So there’s this town, where they sell wooden blocks and move chits around. Your goal is the be the best one at this and generate the most Victory Points”. I think that Valerie and the other reviewers have all noted that this game is essentially themeless – the game could have as easily been set in a junkyard, modern farmer’s market or outer space… but to me, that’s not important, so that doesn’t bother me. Norenberc has some interesting market mechanics (trying to buy low, sell high, and have a majority of the wooden markers). The downside for me is that it often feels like a grind to get anywhere. It has not been uncommon for me to spend actions to buy and sell stuff to generate 2 bucks – which can be quite important for the game – but can be quite tedious at the same time. The other thing which troubled me was the convoluted final scoring. Yes, there are multiple ways to score points at the end – but without a proper reference, most of the players in my three games were confused until the end when we calculated the scores because there were simply too many scoring categories to remember. I have since made a small reference sheet to outline the different scoring possibilities, so maybe this will help out. In the end, there are parts about Norenberc that I like, but not enough to overcome the things that I don’t like or find tedious. Neutral. This entry was posted in Reviews and tagged andreas steding, Norenberc, White Goblin, Z-man. Bookmark the permalink. Well, an inauspicious game, but an auspicious start. If you can keep up this quality of content, OG will be one of my top daily reads. I like the game, nice material, nice flow of play. With too many players it can be difficult to see the whole gameboard(s). Big thumbs up for this review format allowing others to give their opinions about the game. I like how this is laid out, with the main review followed by additional commentary. The inclusion of a ratings summary, kept very simple, is also a nice touch. Overall, the review and what follows has something of a round table feel, which I like. This is a great start, everyone. Really nice review! And I like that other reviewers who I respect weigh in at the same time. This is a great format. Nice review and great format. Like the Supremes with concurring and dissenting opinions. Keep it up!